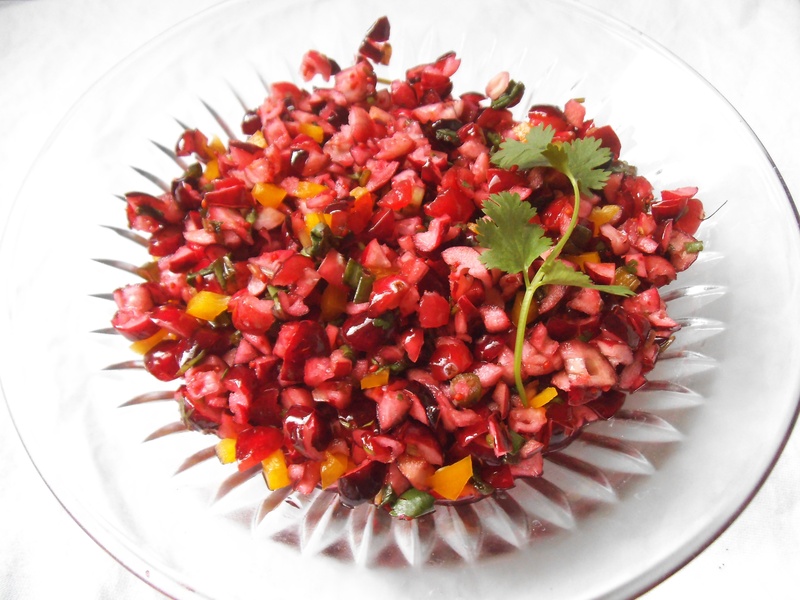 Today we are graced with a recipe for cranberry salsa, just in time for parties and holiday celebrations. With Grey Cup parties and American Thanksgiving happening in November, and Christmas next month, sweet and tangy homemade salsa is a winning appetizer option. Cranberry salsa would also make a perfect host or hostess gift for any upcoming get together. This recipe comes from a dear friend from my college years in Illinois. A true epicure and native Oregonian, anything from Jane is bound to be exquisite. What’s more, she enjoys blessing others with her culinary skills. So be sure to scroll down and get Jane’s tips on how to bundle up a jar of cranberry salsa to give away, which I am sure she has done often! Getting to prepare this recipe gladdened my heart. First, because I felt thankful for the friendship that brought it my way. And secondly, Jane’s salsa offered a new way to serve cranberries. I chose to serve the salsa with homemade Swedish hard tack crackers, and it was a delicious pairing. Since I wasn’t sure that my family would appreciate the jalapeno, I split the batch into a mild (with sweet pepper) and a medium version (with jalepeno pepper). As it turned out, the Jane’s original recipe with jalepeno was not too spicy at all. It was perfect! Another reason for me to give thanks. 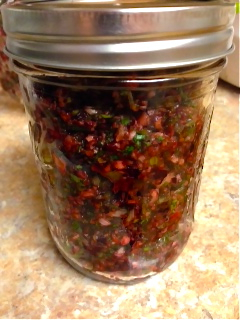 Make this gorgeous red and green salsa and you’ll be thankful too! Use a food processor to finely mince the cranberries. Place those in a large bowl. Place the green onions, jalapeño, and cilantro in the food processor and mince. Toss in with cranberries. Add sugar and juice. Refrigerate at least 4 hours. Serve as an appetizer with crackers, or use as a topping for a pork roast. I like to serve it at a party with a round of softly baked brie cheese, but that is, of course, optional. This can be made and canned in wide mouth 1/2 pint jars. Use a boiling water bath for 10 minutes. Use a small square of Christmas fabric and a pair of pinking shears (the scissors that cut with the fringe edge), then place over the top of the lid; use a screw-on lid to secure. Safety pin the recipe to the fabric and sell at a bazaar, take it to a cookie exchange for a different treat, or give to friends. Shared at Allergy Free Wednesdays, Pennywise Platter, and here. This cranberry salsa looks like it needs to hit my table this Thanksgiving! Yes, it does! It’s delicious and festive! Wow! This looks delicious. My husband would love this as well! It’s such a great recipe that tastes as good as it looks! I’m hoping to try the remaining salsa over pork or chicken soon. 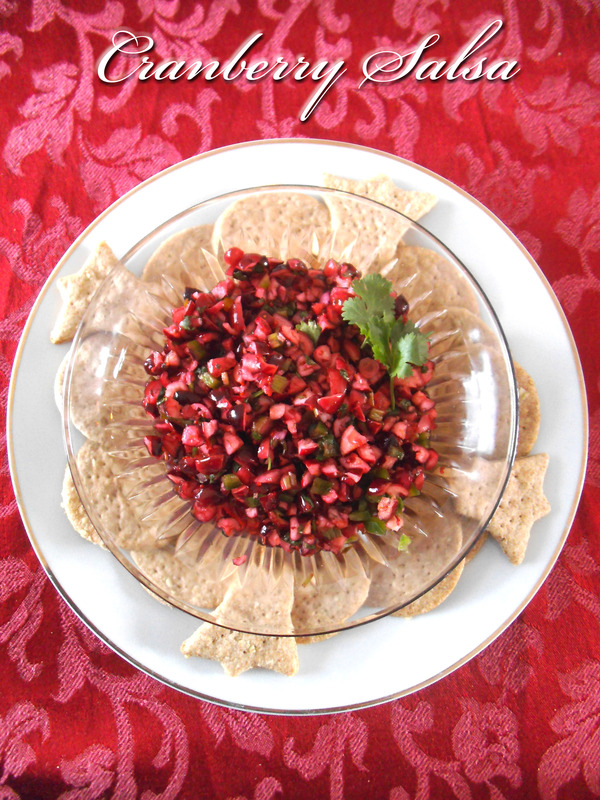 Love the idea of a cranberry salsa in place of cranberry sauce! I get so bored eating the same things – this is great way to change it up. Oh, that looks delicious. What a great use for cranberries (which honestly I think are under appreciated). Thanks for sharing.